It is generally agreed that onions will be in shorter supply in South Africa the coming months, but opinions differ on when the shortage will start manifesting itself. Some in the industry expect it to be felt from January onwards, but others believe that volumes will be fine until March or April, as long as volumes from Ceres, second largest production region, hold. However, onion prices have doubled over the past week because the shortage is already here, one major producer says. 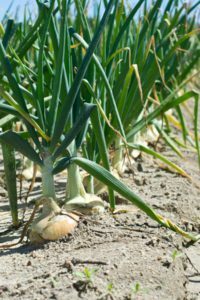 A hail storm last week affecting substantial acreage of onions around Christiana – volumes that were due to go to market over the coming two months – will further accentuate the shortage. Current onion supply on the fresh produce markets (this time of year mostly from Limpopo and Brits) are roughly 700,000 x 10kg bags lower this year than last (2.1 million versus 2.8 million x 10kg bags). FreshPlaza was told that northern volumes are down after a reduced growing season (late planting as a result of the very dry summer) and lower volumes from Brits due to quality problems. A large amount of onions was marketed simultaneously during late August and September, pushing down prices; farmers need to market their onions before the summer rains start as well as to clear harvesting and packhouse capacity for potatoes.